We are pleased to announce that 2.6 version of iTop is now available ! What’s new in iTop 2.6 ? It is now possible to tag an object with multiple values intuitively to show the domains involved. This feature allows you to search for objects having a given tag, apply or delete a tag to multiple objects. 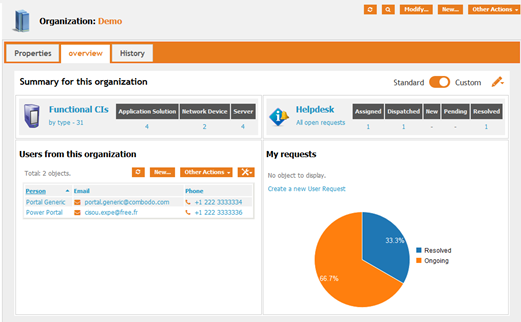 In iTop 2.6, a dashboard can be associated with an Organization, a Team, a Server... and display information about this specific object. The Dashboard Menu is printable and can be sent to a virtual PDF printer. Moreover, a user who has customized a Dashboard can switch back and force between his own customized version and the standard Dashboard. Two new triggers have been added to meet the notifications requirements when updating or deleting an object. Stay tuned and don’t miss the latest news ! 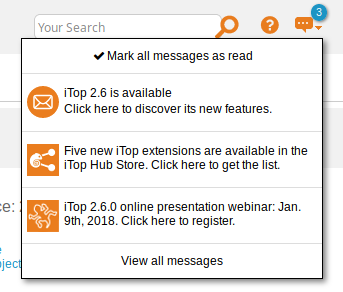 Information such as the release of a new version of iTop, new extensions available on the iTop Hub Store or webinars will be sent as messages in your Newsroom.